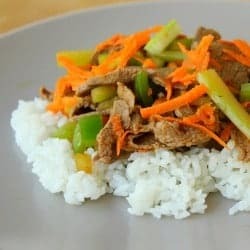 30-minute beef teriyaki! 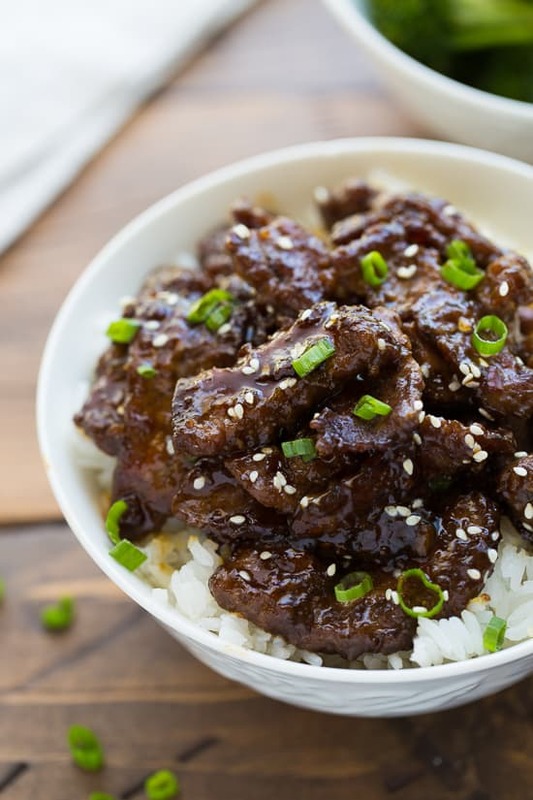 Crispy beef and a quick teriyaki sauce all made in one pan that will rival any take-out dish. 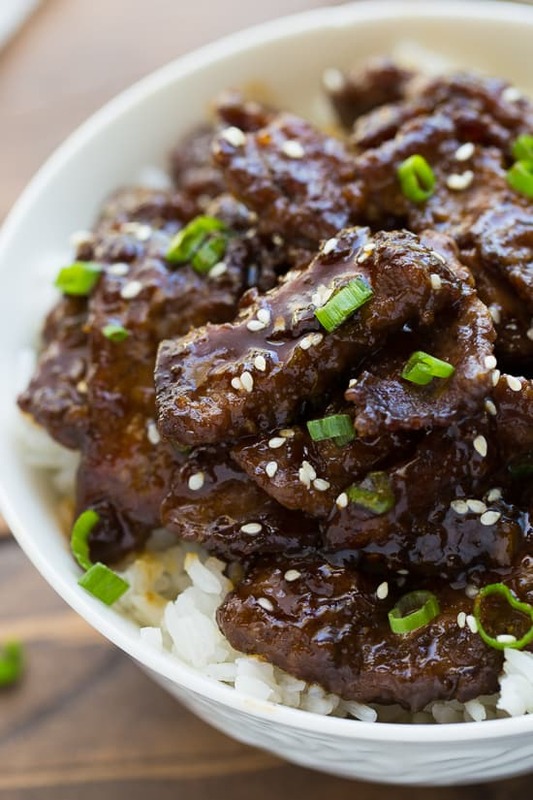 Easily gluten-free when made with gluten-free soy sauce. My husband and I recently went on a trip to LA for our anniversary. We ate out, went shopping, saw a concert, slept in, and sat in traffic without crying babies (thanks LA!). It was only 2 1/2 days, but it was fantastic. And props to my non-gluten-free husband who supports traveling all over the city to try out gluten-free restaurants I’ve researched. Now I’m dying for a Shop House Kitchen to open where I live. I got the chicken satay bowl with a mango sticky rice parfait. It was quick lunch heaven. 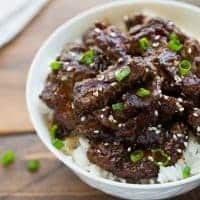 This beef teriyaki is a homemade version of another one of my favorite restaurant dishes. 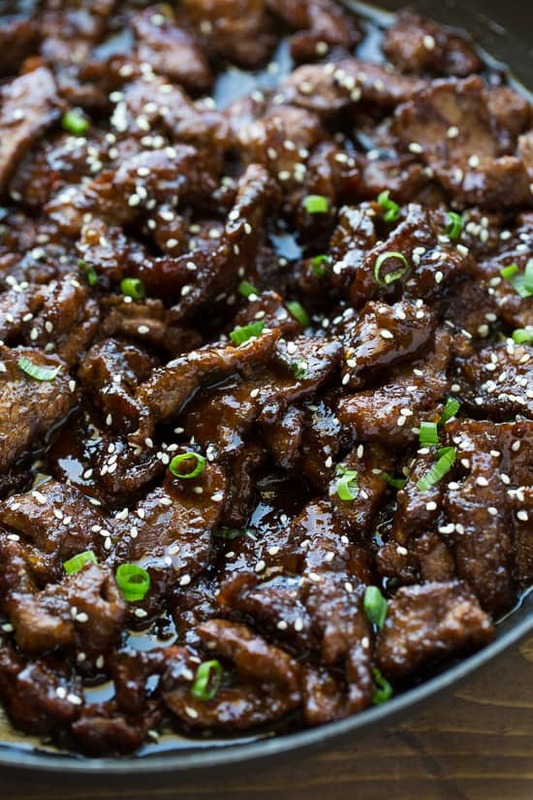 It reminds me of the Mongolian beef from PF Chang’s. I actually like this version better! I don’t enjoy the giant pieces of green onion in the PF Chang’s version. Instead, I like to serve this dish with broccoli or snow peas. The beef gets coated in cornstarch then quickly sauteed on each side so it gets nice and crispy. 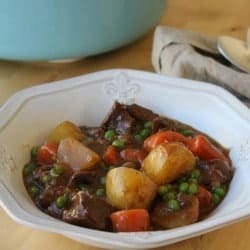 I like to serve this immediately after combining the beef and sauce so the beef stays a little crispy, but the leftovers are still so good! To think there was a time in my life I didn’t like leftovers. Now I’d starve without them. When you think of summer cooking, grilling is usually the first thing that comes to mind. I also think of stir-fries. They are quick, easy and don’t require the oven. 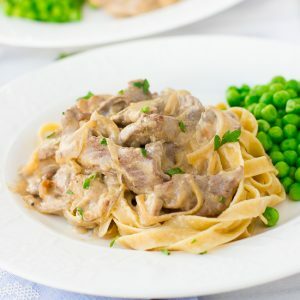 My kids love the flavors of this dish. Anything teriyaki and they’re sold! I love serving this with rice and steamed broccoli. Sometimes I also like adding in snow peas along with the beef. Be sure to use gluten-free soy sauce (tamari) to keep this gluten-free. Slice the flank against the grain into strips, as thin as possible. Place the steak in a ziploc bag and add the cornstarch. Toss to evenly coat. In a small bowl, mix together the tamari, brown sugar, water, cornstarch and red pepper flakes. Stir to dissolve the sugar and cornstarch. Heat a large skillet over medium-high heat. Add 2-3 tablespoons coconut oil and heat until hot, carefully add 1/2 the beef in an even layer, breaking up any chunks. Let cook undisturbed for 4-5 minutes. Using tongs, flip the beef to the other side and let cook for another 2-3 minutes. Transfer to a plate. Repeat with the remaining oil and beef. After transferring the second batch of cooked beef to a plate, Add a little more oil to the pan if needed and turn the heat to medium. Add the green onions, garlic and ginger and cook being careful not to burn for about 1-2 minutes. Add the sauce mixture and stir to combine. Bring the sauce to a simmer and let cook for 4-5 minutes until it thickens. Add the beef and serve immediately so the beef stays crispy. Serve with rice. Enjoy! I made this tonight and it was INCREDIBLE! Thank you so much! I can tell this will be a new favorite! I’m so glad you liked it! Thanks for the comment! Love that photo of your family at Christmas time. Very tasty recipe! Everybody loved it! Thank you! Could you use chicken in place of the flank steak? I bet this would be great with chicken! Glad you like it!